Vary simple and delicious traditional Bulgarian salad. 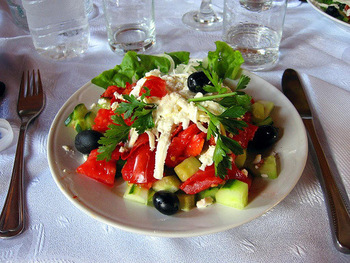 You can find it in all Bulgarian restaurants in the world. Chop tomatoes and cucumber on cubes. Then chop the onion and peppers on thin slices. Salt vegetables and pour them out with vinegar. Put cheese cubes and parsley at the top. Add olive oil at the end. You can add olives.